The Braun Iontec hairbrush uses active ions to make your hair smoother and shinier than ever without applying heat like a conventional hair straightener. Exceptionally easy to use, all you need to do is push a button to activate the ion jet before brushing your hair as normal. 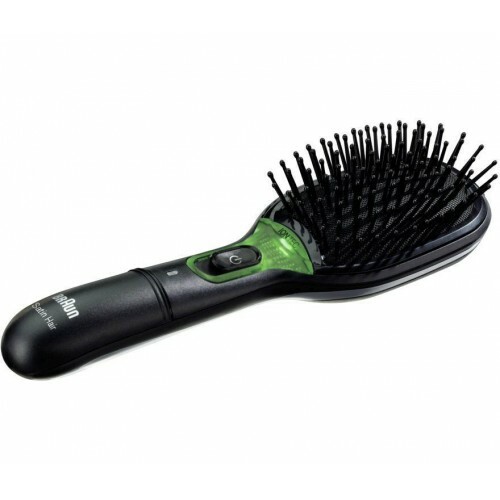 It achieves and instantly healthy and vibrant shine while preventing damage to your hair, and the cushion pad of the brush may be easily removed for cleaning. The hairbrush also highly portable, and it may be used wirelessly making it a suitable substitute for a normal hairbrush. Ions are basically atoms in a neutral state, and when they interact with your hair, they prevent individual strands from moving apart from each other, leading to a straighter, smoother style. 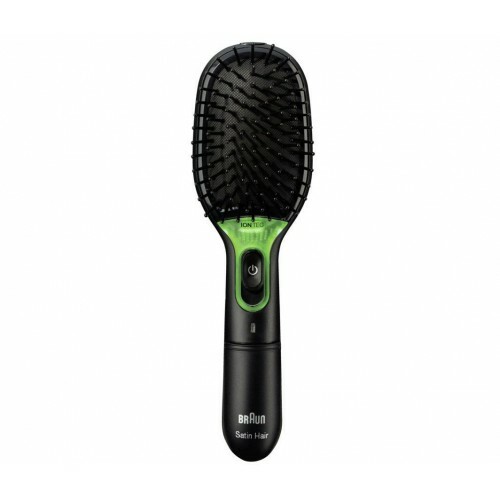 The Braun Iontec hairbrush features an active ion jet which releases ions in the form of a halo around your hair, working in a similar manner to a conditioner. As you brush your hair, any frizz will be instantly smoothed out for a cleaner, shinier look. Compact and lightweight, the Braun Iontec hairbrush is easily transportable, and it should easily fit into your handbag. It automatically switches off when you're not using it, while a travel lock function helps to ensure that it doesn't get switched on automatically when you're carrying it in your bag. The brush is also fitted with a soft and plush cushion pad designed to gently massage your scalp and provide a comfortable and effective brushing experience. The cushion pad may also be easily removed for quick and convenient cleaning. Why Should You Buy this Hairbrush? Providing an entirely new way to brush your hair, the Braun Iontec hairbrush is an excellent choice for women seeking to maintain smooth and straight hair. Bought as I had a voucher from a previous order and thought I would give it a try.nTo be honest I wasn't really sure that it would live up to its promise, but after brushing with it for a few days now I have been pleasantly surprised. It has made a difference with my hair lying flatter for longer, and more shiny than before. Still think it's quite pricey for what is essentially a brush but overall I'm satisfied with it.